And there's the shortwave capture on tonight's EC run. Hahaha. You're missing the last 4 days of the run. On closer inspection, it hasn't quite been captured but comes close. 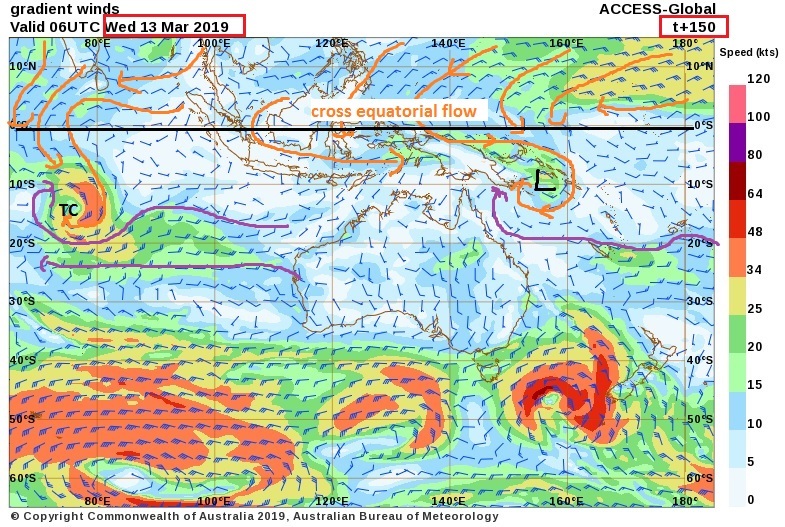 ACC G has our ex Nth East coast low developing into an INVEST by ~ Monday 11th feb. On the Fiji/bom border ~163e. Intensifying into a TC by Tuesday the 12th feb . And just to terrorise us some more , starts to track SW on Thursday the 14th as a significant TC.. Certainly a TC watch on the cards soon. There appears to be some consensus building between the major models of the tropical low off the FNQ coast moving east and deepening. EC and GFS have it moving east quite quickly and merging with another low pressure area near the Solomons. However, Access G has it moving slower and intensifying into a TC before it has a chance to merge with the other low area. All models then have a general western movement towards the end of their runs. As usual, Access-G is the outlier with quite an intense system sitting perilously close off the Capricorn Coast at the end of its run. The extended GFS (para) has a similarly intense system near Noumea towards the end of its run. It'll be an interesting few weeks ahead. As usual, Access-G is the outlier with quite an intense system sitting perilously close off the Capricorn Coast at the end of its run. We know it is not going to happen, but we can only hope it does. Heavy rain from St Lawrence south, to deep inland is desperately needed. All the way down through NSW. AN AREA OF CONVECTION (INVEST 96P) HAS PERSISTED NEAR 16.9S 146.7E, APPROXIMATELY 55 NM EAST OF CAIRNS, AUSTRALIA. ANIMATED MULTISPECTRAL SATELLITE IMAGERY INDICATES A WEAK AND DISORGANIZED LOW LEVEL CIRCULATION (LLC) WITH FLARING DEEP CONVECTION DISPLACED FROM THE CENTER MOVED OFF THE COAST OF NORTHEAST QUEENSLAND. RADAR IMAGERY FROM CAIRNS, AUSTRALIA SHOWS FORMATIVE BANDING WRAPPING INTO THE LLC. 96P IS IN A MOSTLY UNFAVORABLE ENVIRONMENT WITH MODERATE POLEWARD OUTFLOW AND WARM (28 TO 29 CELSIUS) SSTS OFFSET BY HIGH (20 TO 30 KNOT) VERTICAL WIND SHEAR (VWS). GLOBAL MODELS ARE CURRENTLY SPLIT BETWEEN TWO SOLUTIONS. GFS AND ECMWF TRACK 96P EASTWARD BEFORE BEING ABSORBED INTO THE SOUTH PACIFIC CONVERGENCE ZONE. ON THE OTHER HAND, NAVGEM AND UKMET ARE TRACKING 96P EASTWARD AND GRADUALLY INTENSIFYING IT. MAXIMUM SUSTAINED SURFACE WINDS ARE ESTIMATED AT 15 TO 20 KNOTS. MINIMUM SEA LEVEL PRESSURE IS ESTIMATED TO BE NEAR 999 MB. THE POTENTIAL FOR THE DEVELOPMENT OF A SIGNIFICANT TROPICAL CYCLONE WITHIN THE NEXT 24 HOURS IS LOW. I have started a new thread on this system here. GFS has picked up a system moving towards New Caledonia late next week. Far out but something to watch. Please, nobody look at the latest extended GFS (00UTC). It will turn you into a pillar of salt. ROFL. I already mentioned it in the SE QLD section. To be fair extended GFS has been hinting at a system coming in from the Coral Sea for about 2 days with a wide array of possible tracks. EC has hints of a very weak low at 240hrs but nothing like GFS. Bhaha. Classic. Now that would be interesting. ACCESS g Has a weak low forming at 152e 5s this week. Hope it's a slow low and sits over Chillagoe for 4 weeks. None of the dams this side of Dimbulah filled up with the previous rain. They are still at a very low level. GFS has been persisting with a deepening low starting near the Solomons the past few runs. Only GFS has it strong and moving Generally S/SE due to an interaction of a upper trough. All other models have it weak and crossing the far north QLD coast. Humm 12z EPS ens did include members on par with the GFS hit. 18Z GFS has a monster system that gets down to 906hPa but recurves before it hits the coast. GFS runs have certainly been trending more towards to the recurve scenario whilst EC still doesn't want a bar of it.